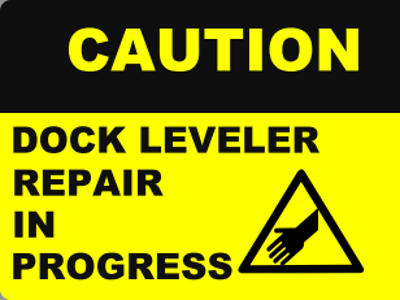 When repairing dock levelers it is essential that you work safely to avoid possible injuries or death. 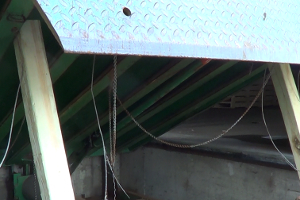 While most people have a natural fear of heights, the proper respect for, and the correct fear of, dock levelers comes only from understanding the forces at work in the mechanisms. 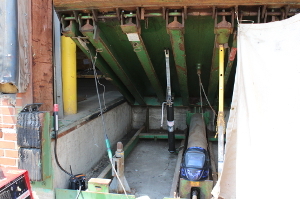 Dock levelers typically weigh as much as 2,000 pounds. The deck hinges support half the weight, but the other thousand pounds needs to be properly supported at all times, either by the internal mechanisms of the leveler or by strong support struts. As with construction, electric and plumbing work we suggest you check with your city to see if there are any ordinances that would regulate dock leveler work. 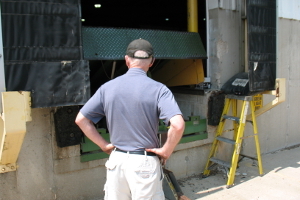 While it is impossible to cover every hazard in repairing loading dock equipment, the information below will cover the most common safety concerns. 1. 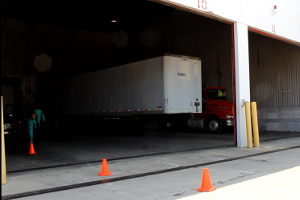 When backing trailers into loading docks from outside sunlight, truck drivers often can not see vehicles or repair men working in the dark. Post two or three pylons in plain sight to warn the drivers that your are inside. If you are working out of a truck, back your truck up to the loading dock. Besides providing better access to your welder and tools, the barrier will provide a buffer from any truck that should miss the cones. 2. Place safety cones along the inside of the dock pit as well. 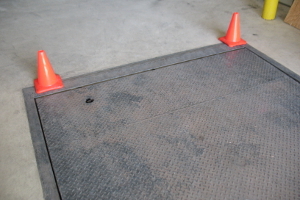 This alerts forklift drivers and others working in the warehouse to stay clear of the dock leveler. If dock workers are present, explain to them the importance of staying clear of the work area. 3. When working inside an enclosed area post at least one other person outside for safety in the event of an accident. 4. 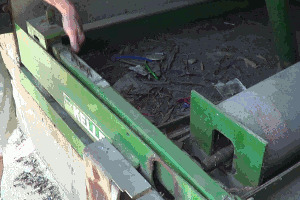 The deck and lip of a leveler weighs about a ton. Before working under a deck support it with at least two safety struts. Most levelers have one built into the framing; you can order additional safety struts on our site. 5. If you are planning to perform major work that compromises the internal deck support such as replacing balance springs, tightening or replacing hydraulic fittings or hoses, or working on air bags or the power leads to them, we recommend supporting the outside edge of the deck with at least three struts. This can be done by adding two 4"x 4" wood supports to the third built-in or removable safety strut. Install the built-in strut first, and cut the 4"x 4" supports the proper length so that all three struts support the deck evenly. 6. 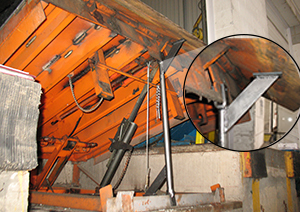 The main safety strut is typically located towards the front of the leveler pit. 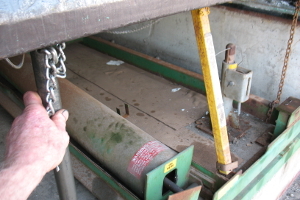 Some struts are attached to the dock leveler and pivot into place, others are disconnected and fit onto mounting points at the top and bottom. To install an attached main safety strut, start by finding it at the bottom edge of the dock leveler and raise it upwards. 7. Extend the end of the safety strut. 8. 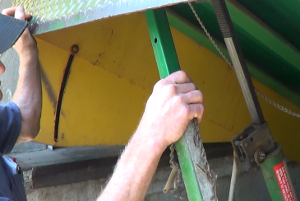 Hold the lip of the dock leveler up with one hand and raise the safety strut to a vertical position with the other hand. 9. Set the end of the safety strut in the empty slot beneath the dock leveler. 10. 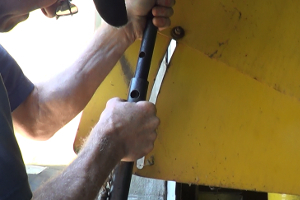 Insert the attached pin into the aligned holes of the safety strut. 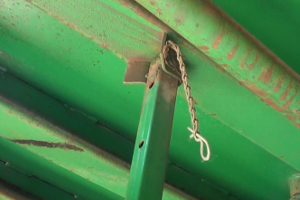 Make sure that the pin is secure through both bars of the safety strut. 11. 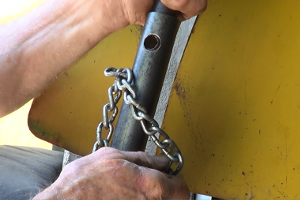 Insert the attached clip into the end of the pin, securing it to the safety strut. 12. 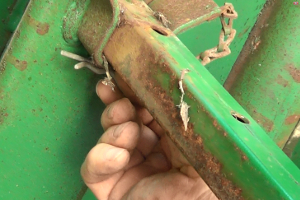 Insert the attached clip in the top of the safety strut, securing it to the slot beneath of the dock leveler. 13. 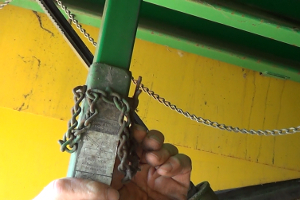 To install a removable metal safety strut, rest the fork at the bottom of the strut onto the bottom edge of the dock leveler and extend the end of the strut. 14. 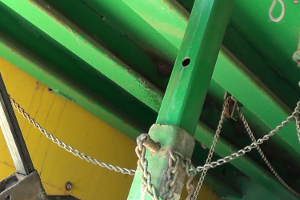 Twist the safety strut until the two holes on the bar align. 15. Position the top of the safety strut as shown to support the lip. This will help prevent head injuries and it will increase the size of the space for climbing and working under the deck. 16. Insert the attached pin into the aligned holes on the safety strut. 17. 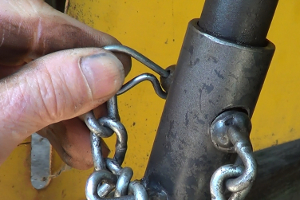 Insert the attached clip into the end of the pin, securing it to the safety strut. 18. The safety strut is designed to work on almost all units. Here is one way it can support a Serco dock leveler. 19. Do not weld unless you have the necessary experience. Also, wear the proper safety equipment and protective gear. 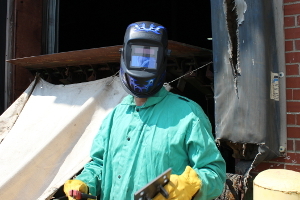 To protect against hazardous fumes that collect below the deck wear a respirator mask under your welding mask. The American Welding Society has published an excellent page addressing fume hazards at Respiratory Protection Basics for Welding Operations . 20. 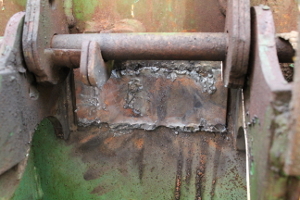 Carefully inspect the parts and surrounding area where you will be welding. Make sure they are clear of grease and other flammable substances. It's not unusual for the floor under the deck to be covered with wood chips, papers and other flammable items. Clean the pit floor before welding. 21. The dock pit is also a confined space. Raise the deck as high as possible to maximize space for working. Organize your work before climbing inside. Place your tools and replacement parts under the deck in such a way that you can move around easily and work safely and efficiently. This will help reduce the risk of injury. You'll find more helpful information at Hot Work in Confined Spaces.